Tambor sits on a calm horseshoe bay called Bahia Ballena or, in English, "Whale Bay". Originally named because during the dry season whales used to frequent the bay, however, with the increased coastal activities it is a rarity to see them here. The calm and shallow waters of the bay provide great swimming and make for a perfect family holiday. You can take a tour of Islas Tortugas that offers excellent snorkeling and diving, do some sport fishing, horseback ride, lounge in the shade of palm tree, play beach volley ball on the soft grey-colored volcanic sand and explore nature. The nearby Curu Wildlife Refuge delights eco-tourists and animal lovers and is one of the highlights on the Nicoya Peninsula. The privately owned 1,496 hectare property includes beach, estuaries, mangroves and rivers. With over 200 speices of birds including motmots, white-fronted amazons, laughing hawks, woodpeckers and herons, bird-watchers are sure to be delighted. Ocelots, pumas, margay cats, collared peccari, coyote, anteaters and capuchin monkeys are among the mammals to be spotted here. And, the beach provides sitings of pacific ridley, hawksbill and green sea turtles. Tambor has an airport which is the only one in the southern region of the Nicoya Peninsula. 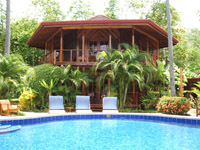 Sansa and Nature Air fly regularly and there are all-inclusive hotels and resorts in Tambor.